Madame L thanks all her Adoring Fans and the Dear Readers of her blog and Aunt Louise's blog for their patience. Madame L thinks all those aforementioned people should run, not walk, to their nearest bookstore to buy Neil Gaiman's latest novel, "The Ocean at the End of the Lane." Madame L has been doing a lot of catch-up fiction reading lately, and this is the one book of all those 10 or so she's finished in the past two weeks that she recommends whole-heartedly to everyone. Madame L hopes you've read other books by Mr. Gaiman and maybe even seen the movie "Coraline," a beautiful little animated movie made from his beautiful book (also titled, not coincidentally, "Coraline"). If you haven't, though, "The Ocean at the End of the Lane" is an excellent place to start in your enjoyment of Mr. Gaiman's inimitable story-telling. Madame L doesn't want to spoil the book for you, so all she'll say here is that if the lake or pond at the end of the lane turns out to be really an ocean, you can expect strange things to happen there. To get an idea of what the book is like, you may enjoy watching these two minutes of Mr. Gaiman reading an excerpt from the fourth chapter of "The Ocean at the End of the Lane." But whether you watch either of these video clips or go back to whatever you were doing, get "The Ocean at the End of the Lane" and read it. Thanks to Val and Marcelo for showing me this, and many others, which I'll be sharing in coming days. This has some of my favorite Monty Python characters, plus Marty Feldman. Enjoy! My dear but slightly more evil twin sister Madame L is back! She may not get up to speed immediately, but she has posted an interesting and, she asserts, funny legal response to a cease-and-desist letter. If that response gives any of her Dear Readers any ideas about similar responses to similarly maddening bureaucratic legalistic nonsense, I know she'll be glad to hear those ideas. Madame L will also get back to answering her Dear Readers' questions about whatever (or whatev) Said Readers are interested in. And Madame L hopes her wonderful co-contributors, Coach Laura and Aunt Ellen, will also be able to re-start their wonderful columns. Thanks to Laura for making this video, thousands and thousands of words worth of images, better than I can write about that amazing experience. I'll post more, later. For now, just one more thing: Thanks to EVERYONE who contributed and helped in any and every way. We're doing it again next year for sure. Now, after all that intensity of the past few weeks, it's time to "taper" before the big ride on Saturday. 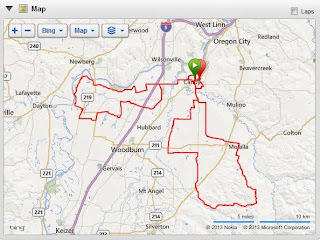 So, on Saturday I took a much shorter ride, about 24 miles long on the Banks-to-Vernonia trail, from Banks to the place where I dropped my bike that first time (near the Top Hill trail-head), and back. Jeff rode with me, which made it much more enjoyable than those rides I'd been taking by myself. 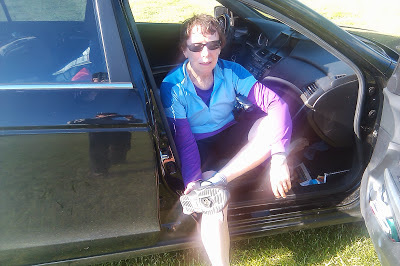 But then when we got home I felt much more tired than I had the previous Saturday after riding over 100 miles. We decided it must have been because had we ignored the Chocolate Milk Shake Secret and decided not to get a chocolate milk shake. Someone had told me that the perfect recovery drink after a long ride is chocolate milk, because it has the perfect 4-to-1 carbs-to-protein ratio for recovery. So, after the Pioneer Century ride, we stopped at the first fast-food place we saw and got a chocolate milk shake. (Yeah, I know that's different from chocolate milk!) And I felt much better Saturday night and Sunday and Monday than I had after the 80-plus-mile Reach the Beach ride. So that must have been the secret, right? This time we decided to go straight home, and I had some chicken soup instead of chocolate milk. If only I'd had the milk shake! Anyway, for sure I'm going to carb up the night before and have some chocolate milk --- or a chocolate milk shake --- after I finish the Huntsman 140. 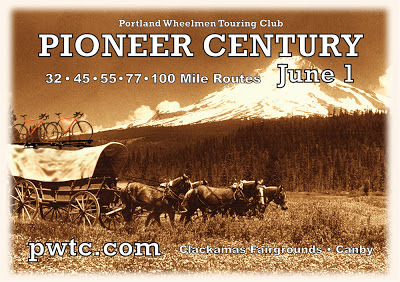 So, when I finished that Pioneer Century ride, I was glad I'd finished it but discouraged at how long it took. I got back to the fairgrounds while they were shutting everything down, and there were only a few people left there. Some guy I'd seen on the ride was driving out, and he stopped and backed up so I could get in the driveway, gave me a big smile and said, "Congratulations! You made it!" Jeff was waiting for me a few meters farther in. 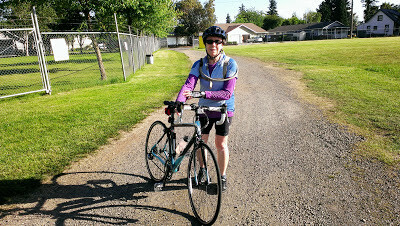 He took a photo of me walking my bike on the gravel road coming into the grounds, then he took the bike and walked it to the car for me, and then he told me to sit down, and when I couldn't even take off my shoes, he did that for me, too, and put my other shoes on my feet for me. I was that tired! Yet I felt like if I'd needed to I could have gone farther, just like I did those last 25 miles with no energy left, just determination. Or maybe I'm delusional. Yeah, that's probably it. Anyway, one thing I learned was, on hills, after you've geared down as much as possible, keep on pedaling until you're about to fall off your bike (at around 3 mph for me) and then stop and have some sports drink. And then you can go again. I learned I could keep on going even when my legs and lungs were burning by counting down the miles, one by one. And then, from talking to Derek afterwards, I learned that I hadn't fueled up properly before or during the ride. I mean, I THOUGHT I had. I had eaten a lot of carbs the night before, and that morning --- not just a boiled egg --- I mean, I ate some yogurt, too --- but that's the point: that wasn't enough. And, as Jeff quoted me, quoting Derek: "I started on empty, then added one gallon of gas when I got tired, instead of filling up when I needed to." Everybody has advice for the Huntsman 140, and I'm taking it all in and using the bits that seem doable for me, and of course I run everything past Derek first. The closer I get to June 15, the more the motto Neva and Laura came up with for our shirts seems even more applicable, and so much better than my idea (purple with yellow lightning bolts). Here it is, our thanks to our support team who will be there with us on June 15, and all our supporters who can't be there except in spirit. 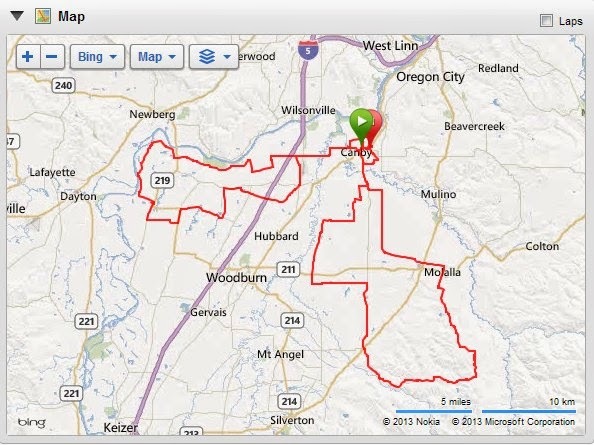 Antidote for Bitterness: Read "In the Desert"
This is what I did on Saturday, June 1: I rode 100 miles on my bike. Actually, more like almost 103 miles. 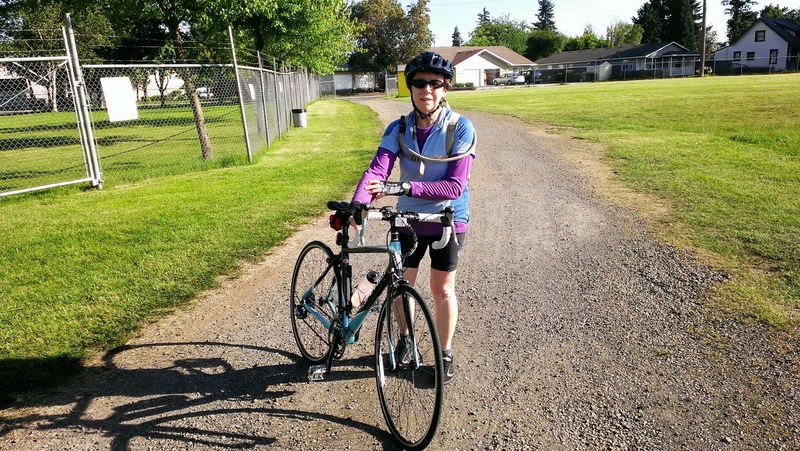 While I'm proud that I finished, and I learned a lot that will help me in the Huntsman 140, one of the things I learned is that I'll have to pedal a lot faster to make the time I'll need to make. Here's the ride, which started and ended at the Clackamas County Fairground just southeast of Portland. And here's me at the end of it. I had the best possible support anyone could have: (1) my sweet and amazing husband, who was waiting for me at every rest stop and some places in between, with hugs, refills for my sports drink, and refills for my spirits, and (2) my amazing trainer, Derek, whom I texted at every rest stop, and who replied with more encouragement and instructions.